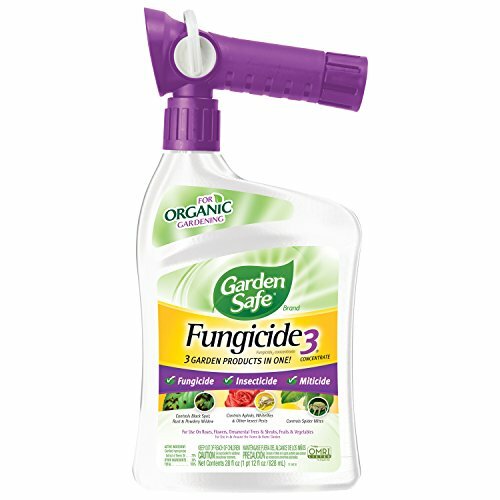 Garden Safe Fungicide3 Concentrate protects the garden with 3 effective products in one easy-to-spray formula. Contains neem oil which is a fungicide, insecticide and miticide in one - stops powdery mildew in 24 hours. Can be used up to day of harvest. Garden Safe Fungicide3 Concentrate can be use on garden plants, including roses, ornamentals, vegetables, fruits and house plants. It is a great pest-control alternative for people who are concerned about using synthetic chemicals in their garden. Effectively prevents and controls various fungal diseases including powdery mildew, black spot and downy mildew and controls aphids, spider mites, scale, whiteflies, beetles, leafrollers and other insect pests. New QuickFlip hose-end sprayer activates spray at the flip of a switch. Read the entire label and follow all precautions and directions. Do not apply to known sensitive plant species such as impatiens flowers, fuchsia flowers, hibiscus flowers, some rose flowers, ornamental olive trees, or some carnation varieties without prior testing. Do not apply to wilted or otherwise stressed plants, or to newly transplanted materials prior to root establishment. Use with care on plants with tender tissue. Check for leaf burn in small scale trials prior to use. As with other oil-based products, exercise care in timing applications to early morning/late evening to minimize the potential for leaf burn. Garden Safe Fungicide3 Concentrate is OMRI listed so it’s ideal for organic gardening. OMRI Listed products have passed a rigorous review to ensure they can be used for organic gardening and meet the USDA’s National Organic Program requirements. DIRECTIONS FOR USE: FUNGICIDE USE: For use on FRUITS, VEGETABLES, HERBS, SPICES, ROSES, FLOWERS, TREES and SHRUBS. Application Instructions: Garden Safe Fungicide3 Concentrate is an effective fungicide for the prevention and control of various fungal diseases including powdery mildew, black spot, downy mildew, anthracnose, rust, leaf spot, botrytis, needle rust, scab, flower, twig and tip blight, and alternaria. As a preventative, apply Garden Safe Fungicide3 Concentrate on a 7- to 14-day schedule until disease development is no longer present. To control disease already present, apply Garden Safe Fungicide3 Concentrate on a 7-day schedule until disease pressure is eliminated. Then continue spraying on a 14-day schedule to prevent the disease from recurring. To prevent rust leaf spot diseases, anthracnose and scab, begin applications at the first sign of spring budding. To prevent powdery mildew, apply in midsummer or when disease is first detected. Continue applications until disease pressure no longer exists. INSECTICIDE/MITICIDE USE: For use on FRUITS, VEGETABLES, HERBS, SPICES, ROSES, FLOWERS, TREES and SHRUBS. Application Instructions: Apply Garden Safe Fungicide3 Concentrate at first sign of insects/mites. For control of aphids, spider mites, scale, whiteflies, beetles, leafrollers and other insect pests. Garden Safe Fungicide3 Concentrate is most effective when applied every 7 to 14 days. For heavy insect populations, spray on a 7-day schedule. Since 2002, Garden Safe has delivered products including natural-based and botanically derived formulas to growers who prefer to control plant pests and diseases without traditional chemicals. Organic gardeners trust our solutions to keep garden pest control simple – and let nature do the rest. If you have any questions about this product by Garden Safe, contact us by completing and submitting the form below. If you are looking for a specif part number, please include it with your message.